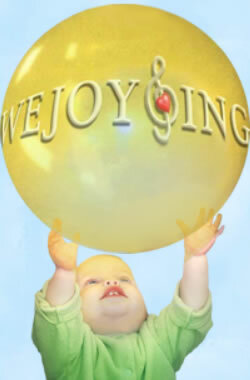 17 Month Old Re-Enacts WeJoySing at Home -AMAZING!! “Bounce, Bounce, Bounce….STOP…SHHH,” directed little Elliott as she re-enacted her WeJoySing “Heart Strings” class at home. Mom grabbed her camera, captured these delightful memories and shared them with Mrs. Karen, Elliott’s WeJoySing teacher, and Mrs. Jo, WeJoySing’s President. They were thrilled to see the tremendous amount of language development and sequencing of thought emerging during Elliott’s musical play. 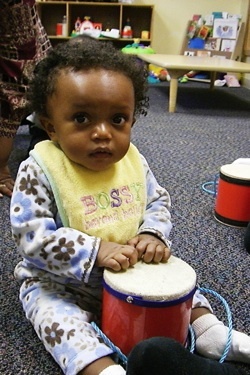 The power of music during our play time with our children extends far beyond smiles, giggles and bonding. 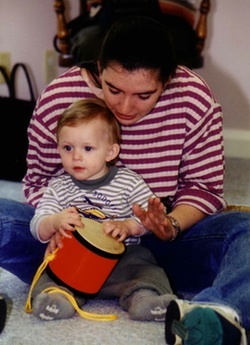 While the child is actively involved in the work of playing; his/her musical, mathematical, language, and emotional intelligences are all being ‘wired’ in the brain. *Elliott’s use of the ‘B’ sounds as she bounces teddy and her use of the ‘T’ sound while she taps her leg demonstrates her phonological awareness and approximations towards the words ‘bounce’ and ‘tap’! *The rhythmic bouncing, stopping and shushing show Elliot’s sequencing skills which will assist her in future sentence construction as she gains more language skills. 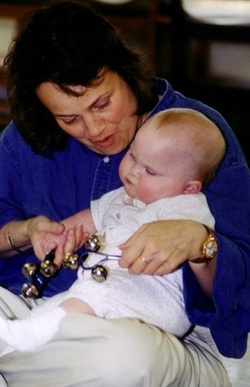 * Bouncing an infant or toddler provides an ideal experience of steady beat. “The child must be rocked, patted, bounced to develop a feeling of the beat. 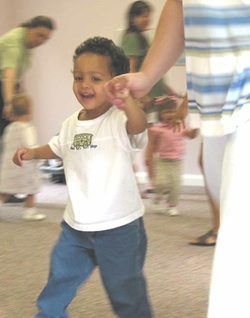 Meter and beat are often used in early rhymes and favorite books which will assist in expanding language development.” (Music and Movement for Infants and Toddlers: Naturally Wonder-Full. By John M. Feierabend, Ph.D.
*Elliot is clearly in the transitional stage of learning where she can now transfer to her teddy bear the things we once did to, for and with her! The class bouncing activities have been internalized by Elliott and she can now ‘do it herself’! The sheer number of words a baby hears affects his language ability later in life. 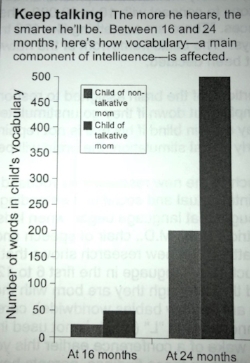 Notice the graph here as it relates to vocabulary development in children who are talked to and within their formative first years of life. Elliot’s videos clearly reveal that she is ‘talking’ excessively to her little baby! Wouldn’t you love to know just what she is saying so vibrantly and lovingly to her teddy? Obviously, her WeJoySing musical experiences have made a lasting impression on this 17 month old little life! These early impressionable years are extremely important in our little ones’ development. The amazing, joy-filled moments of music and play in their lives have far-reaching effects on their overall development and are happily disguised as play! So Bounce, Bounce, Bounce awaaaay! !